Name Ahmadzai, Ahmad Shah Eng. Interior minister in the mujahedin government formed in 1992. Construction and education minister at various times. Prime minister of Afghanistan 1995-1996. Ahmadshah Ahmadzai was born in 1944 in Malang village in the Khak-e-Jabar district of Kabul. He studied engineering at Kabul University, graduating in 1967. He then worked in the agriculture ministry between 1969 and 1972, when he won a scholarship to Colorado State University, where he completed a master's degree three years later. He then took a lecturing post at the King Faisal University in Saudi Arabia, but when the Communists took power in Afghanistan in the coup of 1978, he came to Peshawar, in Pakistan's north-western border region, and joined the mujahedin. Initially he was part of Jamiat-e-Islami, rising to become Rabbani's deputy, but he joined Sayyaf's group the year communist rule ended and the mujahedin came to power. After the government of which he was part fled before the Taleban advance on Kabul in 1996, Ahmadzai left the country altogether, living in Istanbul and London and only returning to Afghanistan after the Islamic militia were driven out by the US-led Coalition and its Afghan allies in late 2001 and a new transitional government set up. Ahmadzai, an ethnic Pashtun, was a leader who once headed the government-in-exile over the border. He fled Afghanistan when the Taliban came to power and took refuge in Turkey and Britain, returning only after the Taliban's defeat in late 2001. He was a candidate in the presidential elections 2005 an selected as his Vice presidents: Aminullah Shafajoo, Abdul Manna Urzgani. 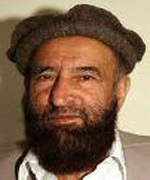 Ahmad Shah Ahmadzai is the head of the Hezb-e-Iqtedar Islam political party. His party belongs to a political alliance named Jabahai Tafahim Millie or National Understanding Front which includes, but is not limited to such parties as Hezb-e-Afghanistan Naween led by Mohammad Yunis Qanooni, and Wahdat-e-Mardum Afghanistan led by Haji Mohammad Mohaqiq. Ahmadzai was a candidate in the October 2004 presidential elections, he only received 0.8% of the votes. Ahmadzai strongly believes in the establishment of an Islamic system of government in Afghanistan. Ahmadzai is seen by many as a religious conservative. He stated very clearly in his political platform that he wants to create an Islamic government. The kind of government he's offering is incompatible with democracy, which he has described as an imported element that goes against Islam. He has two wifes and 10 children in all. His eldest daughter is a doctor while his eldest son is studying in the United States. During his travels he picked up English and Arabic, in addition to the Pashtu and Dari of his own country.